NEWS – Surfer Dudes look like a miniature surfboard and surfer dude or dudette. These beach toys have been specially designed to automatically return to you when you throw them out into the ocean. 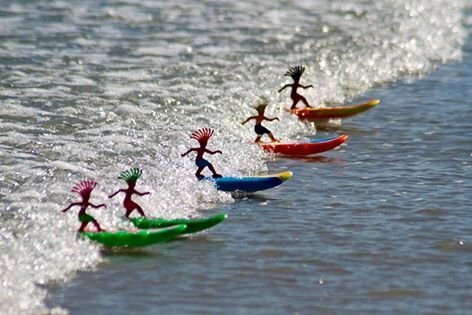 This makes them the perfect toy to take with you on your next trip to the beach. Your kids (and even you) will have fun throwing them into the water just to watch them surf the waves back to you every time with perfect balance. 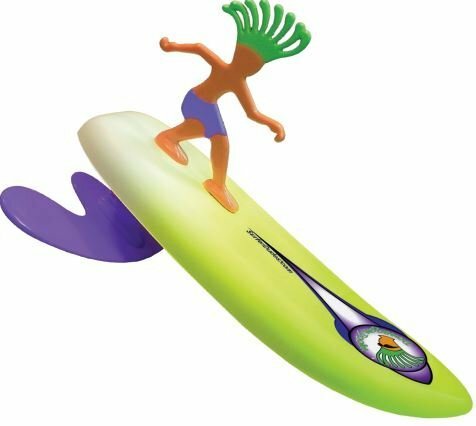 Surfer Dudes are made of ABS plastic and closed foam so they won’t sink. They come in a variety of colors and are priced at $19.99 each. You can order one from The Grommet or Amazon. Looks like fun! I would have to find a beach with warmer water than in my area. It’s too cold here in N. Calif.
Fun for all ages! I’m 40 + and brought mine on a Hawaii trip! Also have given as gifts to many special kids for hours of fun! My girls love this toy! They are 9 and 12 years old! It is of course an amazing beach toy but they have fun with them in the pool too.